India can function on a fully renewable electricity system in 2050. This is the result of a new research by Lappeenranta University of Technology (LUT). The study shows that developing countries that have an abundance of renewable resources do not need to take the path of the western countries where increasing living standards have been coupled with heavy emissions from electricity generation and other industry. They can move straight to renewable systems and do it cheaply. The suggested renewable energy system works mainly on solar energy and batteries. Solar photovoltaics is the most economical electricity source and batteries satisfy the night-time electricity demand. In addition to covering India's electricity demand for power, the system simulation also covers for seawater desalination and synthetic natural gas in three decades. "The possibility that a country like India could move to a fully renewable electricity system within three decades and do it more economically than the current system, shows that the developing countries can skip the emission intensive phase in their economic development. It is a competitive advantage to not to take the road of the developed world", says Principal Scientist Pasi Vainikka. India's idiosyncratic feature is its monsoon season. The monsoon period in India is the only time of the year when solar power is reduced. In the renewable system the lack of solar power would be compensated with increased wind and hydro resources as well as solar power from less monsoon affected neighbouring regions via power lines. This way the system stays functional during the monsoon season. The proposed system is cheaper than India's current system, which runs primarily on coal. The cost of electricity in the renewable system would be 3640 Indian rupees (52 euros) per megawatt-hour (MWh) in 2050 when only the power sector is taken into account. When the demand for seawater desalination and industrial gas sectors are taken into account, the cost is 3220 Indian rupees (46 euros) per MWh. In comparison, the cost of the current system is 57 euros per MWh. In order to achieve its renewable energy goals, India needs to invest in solar and wind energy technologies. The total investment needed would be around 3380 billion euros. This reflects the strong demand increase from 1720 million MWh in 2015 to about 6200 million MWh in 2050. People are at the heart of the proposed energy system. The system creates solar self-consumption for end-users such as private households, commercial companies and industry. They are the so-called PV prosumers. They will close the supply gap by creating a more distributed and resilient energy system. Prosumers can contribute to about 15-20 percent of the total electricity demand of India. This may also enable a faster transition to electric vehicles, which is set as an ambitious target by the government. "Given India's burgeoning electricity demand and the persistent supply demand gap along with the summer shortages and outages, solar PV prosumers will have a crucial role in enabling the country's transition to a fully sustainable energy system," emphasises Professor Christian Breyer. India would benefit in multiple of ways from the suggested system. Firstly, it would help the country to meet its climate change targets. Secondly, there are also real benefits for people. Moving to a fully renewable system would bring also improvements in health conditions. "Not to mention benefits from reduced health costs or even substantial reduction of pre-mature deaths due improved air quality", says researcher Ashish Gulagi. 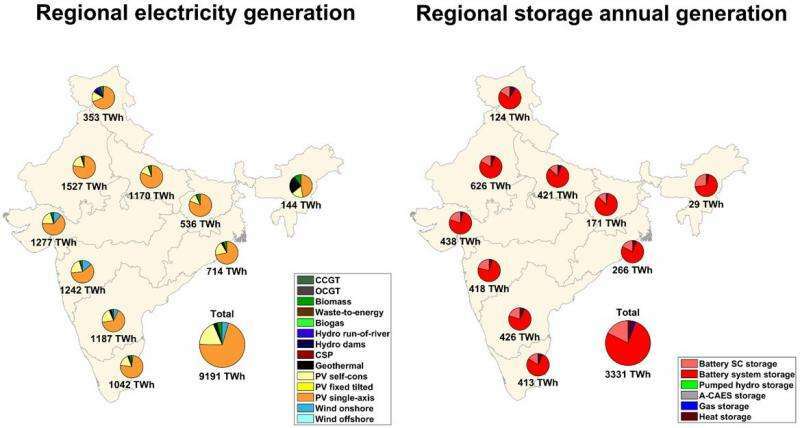 This is the first time when researchers have been able to demonstrate India's transition towards 100% renewables in full hourly resolution and high geographic detail.